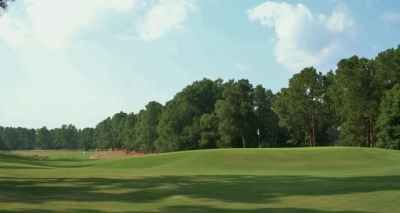 PINEHURST, NC -- “This will either be the smartest thing I’ve ever done, or the dumbest,” remarked Pinehurst Resort owner Bob Dedman, upon deciding to go ahead with a complete restoration of the venerable Pinehurst 2 golf course, home to numerous championships and carrying the title of legendary architect Donald Ross’s masterpiece. 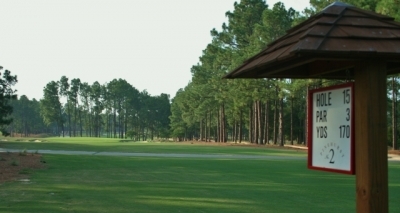 Not to mention the fact that Ross’s #2 Course is the driving force behind Pinehurst’s being known as “The Home of Golf” -- so even touching the layout must come with a considerable amount of trepidation. Donald Ross may no longer be with us, but his words still greet every player before a round at Pinehurst 2. Nonetheless, touch it they did, and several years after the idea was hatched, the course has been restored to its former look and strategy. 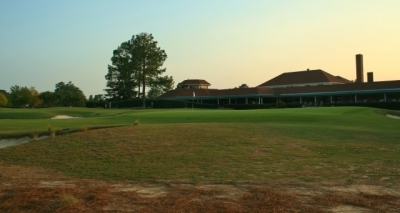 For those who have seen Pinehurst #2 over the decades on TV (as host of the ’99 and ’05 U.S. Opens, amongst others), you’ll hardly recognize it in its latest form – a metamorphosis so remarkable that it could only have a fascinating story to go along with it. Time and spatial considerations won’t allow for a full recounting of every famous event that’s ever been played on #2, but you get the idea. In American golf lore, the course can hold its own with any of the greats – and the fact that anyone can play it anytime they want (in the public sense) makes it all the more special. 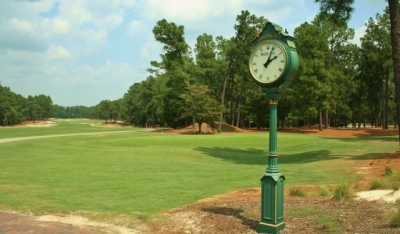 Time may stand still at Pinehurst, but the No. 2 course has a completely new look. That’s not to say that the course we’ve been playing up until a few years ago was the same one that Ross laboriously sculpted and sweated over personally. The fact is, #2 hand changed dramatically since his day. Which essentially meant adding turf to the sides of the layout. And in order to green it up, you needed irrigation. 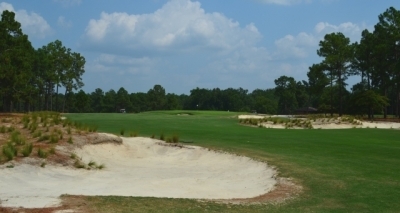 Over the years, what had formerly been natural sandy areas with native vegetation became a sea of Bermuda grass, turning #2 into more of a parkland/park-like setting versus the Sandhills course that its original reputation was built on. Modern golfers didn’t necessarily complain – after all, golf is played on grass (at least most of the time). And the golf market demanded pristine playing conditions – so when you’re going to a course and paying top dollar to do so, the average consumer wants every blade in place, so to speak. The long 16th hole plays as a par four in the U.S. Open -- the rest of the time, it is a good chance to make a birdie as a par five for resort players. And those signature turtle-shell greens were always there, so it was still #2, right? 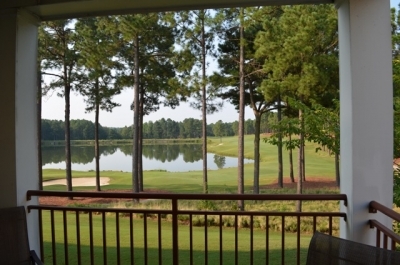 “The number 2 course was still a favorite of people coming to Pinehurst, but it just wasn’t what it was meant to be. This is my personal opinion, but we went through the excess of the 80’s and 90’s with people just spending ridiculous amounts of money doing different things,” Farren speculated. 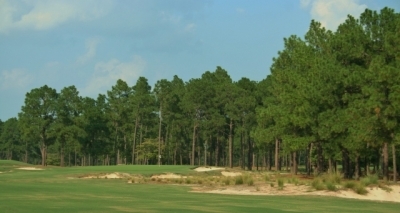 In other words, even Pinehurst #2 had gone extreme. The par four 3rd hole is not long, but you still must navigate the hazards off the tee to have a good shot at the green. So, the decision was made to change it back. Making the “go retro” process a bit easier was the fact that Pinehurst had added other courses that would keep the turf-lovers happy. 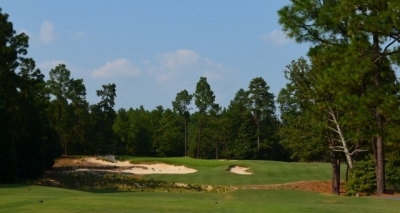 The Tom Fazio-designed Pinehurst 8 had been built with a more modern, hard-lined and landscaped look (with defined bunkers), and Pinehurst 4 had also been renovated (again, by Fazio) to offer the same thing. 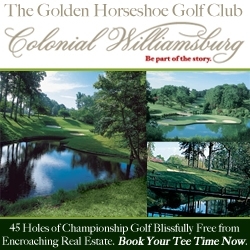 Conceivably, the #2 course could be brought back “to the past” without damaging the resort’s overall brand for offering the finest of golf experiences (in the manicured look) that people expect. 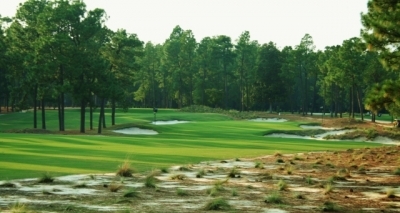 Once they decided to go ahead with Pinehurst #2’s restoration, the question became… what to restore it to? Missing to the right is strongly discouraged on the long par four 12th hole. For anyone who’s seen C & C’s work, they would be a natural choice in working on the project. Their courses, from Bandon Trails in Oregon to Kapalua’s Plantation Course in Hawaii to Sand Hills in Nebraska – all of them lay appropriately on the land and literally look like they’ve been there forever. Not quite the hand of God, but a couple gentlemen with a good idea of what a golf course should look like. And if anyone could summons Donald Ross, it was Ben and Bill – the latter having come from North Carolina and grew up playing Ross’s creations. Davis gave the assurance that it was okay to move forward from the USGA’s standpoint. The par five 4th hole is one of the best birdie chances on Pinehurst 2 for both professionals and amateurs alike. With the necessary approvals in hand from the management and the USGA, it was time to hit the library. Fortunately, a wealth of material regarding the “old” Pinehurst 2 was waiting in the Tufts archives, which made the process go a lot smoother. But it was an aerial photograph from 1943 that was the key to the project, Farren said (and this was also confirmed by Bill Coore). Somewhat compounding the difficulty was the previous work that had been done to the course. With a layout as old as #2, it had already been renovated a number of times before. Farren said the greens had been completely rebuilt in 1986, installing drainage for the first time (they were rebuilt exactly as they were, with the same undulations). The greens then underwent another re-do in 1996, with Rees Jones onsite as a consultant, getting the course ready to host the ’99 U.S. Open (which led to Payne Stewart’s famous putt on the 72nd hole that sealed his legend, four months prior to his death). Jones’ job was mostly to add length to the course, so tees were repositioned and new ones built – but the greens were basically duplicated elevation-wise and undulation-wise exactly as they had been historically. 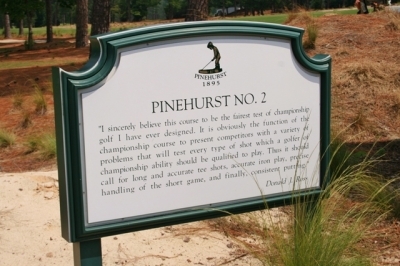 Just because Pinehurst 2 was restored does not mean it is no longer friendly. 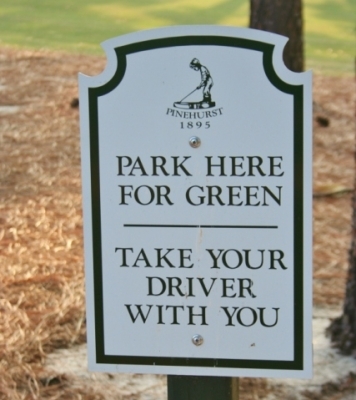 Whether you want to bring your driver with you, however, is up to you. Likewise, the recent restoration largely left those domed greens as-is (though Farren said some minor tweaking was done on the 15th and 17th holes). But there was plenty of work to do from the greens back to the tees, which mostly involved getting rid of the Bermuda grass and bringing the Sandhills look back to the Pinehurst 2. Construction began, and at least in the initial stages (starting in March, 2010), work went on while the course was still open. It gave the architects the ability to interact with the golfers, and the golfers a chance to have Ben Crenshaw watch them tee off – now that is pressure. The “heavy lifting” in the project was done between November of 2010 and March of 2011, when the resort closed the famous layout for its restoration. And unlike other projects that Farren had witnessed (that basically just lengthened the holes), this one impacted everyone. Between 35-40 acres of turf was removed, it turns out. As noted before, the vast majority of the grass that was eliminated was in the form of thick Bermuda rough. And the turf that remains is now cut to fairway height – you may not realize it at first, but the average fairway width has nearly doubled to 40 to 45 yards. The par three 9th hole is simple enough in concept - but playing it is quite another matter. It takes some mental adjustment to remember that the fairways are actually wider than they were before – because with the rough all gone, there’s a lot of sand out there. You’ll have no trouble seeing #2 as a Sandhills course now. No joke. To be fair, a couple gentlemen who joined us for our trip around the restored legendary course found a lot of that sand – and to them, it wasn’t like a day at the beach. They were both long-hitting mid-handicappers, and consistently drove it through the fairways (from the white tees) into the natural areas. It’s clear that the “new” #2 is going to require some period of adjustment for those who are used to seeing wall-to-wall grass. And it might even require a different way of thinking about which tee box you should be playing from, starting with the first tee. At 619-yards, the par five 10th hole is the longest on the course. True enough, the fairway widths short of the fairway bunkers on #2 certainly present an inviting target. But if you’re beyond them – and you don’t like sand – watch out. Farren’s right – the ball is much easier to find in the sand (which speeds up play) and you usually can advance it. The hardpan sand isn’t a shot that a lot of us are used to playing, but there’s little doubt that it’s easier than chopping it out of dense Bermuda rough with a long-iron. The par three 15th hole looks benign until you miss the green -- and then it is a very difficult up and down. It’s just a different way of playing golf – one that has a lot of appeal, if you buy in to the concept. Not all golf courses were meant to be parkland-style, and certainly that’s true of a classic like #2. For all its quality, Farren admits that the restored #2 is not quite the same as the course Donald Ross left behind after passing in 1948 – but in some respects, it’s much better. “When I speak to different golf groups of people, they understand that we have all this new technology from the equipment and balls standpoint, but what a lot of folks don’t take into consideration are the turf conditions that people play on now compared to what they were even 20 years ago. The slope in the back of the green of the long (490-yards) 8th hole really is that severe. Do not go long. “The putting surfaces are far better, far faster, far smoother, far more predictable and consistent. And the fairways as well. Compared to what they were in Donald Ross’s day, but even more recent than that,” Farren added. 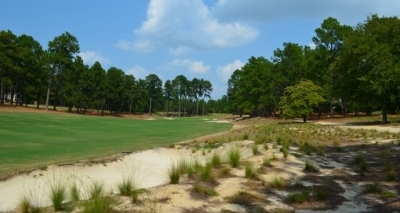 The work may have been completed in 2011 (with the course opening March 4th), but Pinehurst 2’s looks will continue to evolve, due to the emergence of native plant species in the “unfinished” areas. “We have to be selective in the ones that we want to have grow, and the ones we don’t want to have grow. And it’s a seasonal thing -- some of the plants are different in the spring than they are in the summer. So you can play it once a month for a full year, and it won’t be the same each time you play it. Each time, it’ll be a little different,” Farren said proudly. 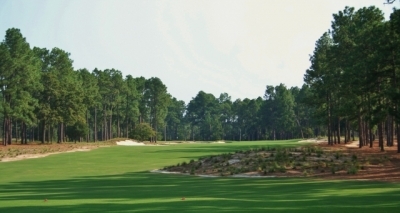 It’s hard to imagine how a course that’s as “old” and “new” as Pinehurst 2 could continue to evolve and change, but that’s probably the greatest thing about a golf layout that’s not only stood the test of time – it’s now better than ever. The sun sets on another day at Pinehurst 2, but you know the 18th green will have many, many more good ones in the future. Pinehurst 2 always was a “must play” for true aficionados of golf architecture: and now the urgency’s been stepped up a notch. It’s great to see a course that’s a classic play as one – an experience you certainly will never forget.